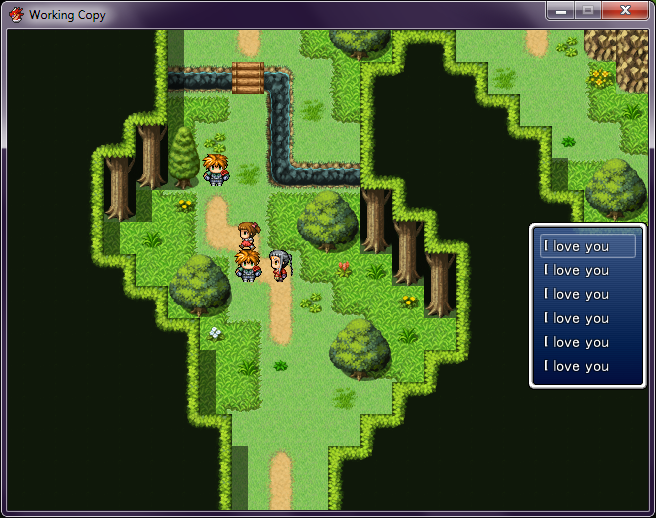 Discussion in 'RPG Maker VX Ace' started by Archeia, Nov 14, 2012. The shake screen has an option in the editor where you can add a "wait" or not. But the glitch involves that it will wait no matter what. But it will only wait a number of frames equal to whatever the speed is set to the default option. For example, the setting is 5 power, 5 speed, 60 frames, and wait. It will wait for 5 frames, no matter what. Artificer, RocketKnight, Katrix Kytarix and 22 others like this. Thank you very much Archeia, it's very helpful for RMVX starters like me!! They're so useful! And it's okay, since you're asking for script calls, it's in the right forum. Artificer, Mihel, Necrofear04 and 1 other person like this. Thought I would add some more to the list. Artificer, Corlagon, ashes999 and 5 others like this. next if i.nil? or i.name == ""
Of course, if you want you can change $data_items to $data_weapons or something else and the amount you want. There is no need to write Input::CTRL anymore. Now it will wait the right amount of frames and not 5. Mihel, ct_bolt, Domin0e and 2 others like this. I can't believe I forgot an important one. Regions. ct_bolt and Acetonide like this. Can we bypass the choice limit by using the script commands? Do you know how to set up what to do when a choice is made? Am I the only one who runs into automatic word wrap in the script call which forces a line break? No, and it can cause your game to crash depending on where it puts the line break. It's best, if your line will be too long, to force the break yourself, after a =+-/*( symbol so it knows it's continued on the next line and doesn't add in its own spaces and break things. Fomar0153 All wrapped up for winter. Upping my current game's resolution upto 640 width was the best thing I did. I never ever have to check my text fits anymore. It's such a time saver. Do you mean like the choice branching? Yes. The code for setting up the choices themselves is above, but the branching is normally created automatically when you use the Show Choices command. If you're now circumventing the Show Choices command, you also have to have a way to fake the When [**] branch that automatically gets created. It's like that script you created the other day where you use conditions, but this thread is for script calls that don't rely on other scripts being installed. It is pretty easy to fake the When [**] command (402). Thank you. I thought it would be something like that, but the params/indent was messing me up. I think the indent will still mess things up since indentation is internal to the game interpreter and event commands and you basically have no control over it. Which means any scripted choice branches will need to use scripts to create event commands, which I think is starting to get a little ugly. is there a way to make script call to have more than 10 lines?